Scott Seviour, a former Head of Marketing at L.A Reid’s Epic Records, has joined Apple Music in Los Angeles in a position that focuses on creating original content. Seviour worked at Sony Music for over 13 years, joining in 2001 as VP of Marketing and Artist Development at Clive Davis’ J Records. He became SVP of Artist Development at RCA Music Group, where he oversaw artist development, marketing and product management – in addition to developing new talent on the Arista Records, J Records and RCA Records rosters. Over 10 years at RCA Music Group, he worked on campaigns for the likes of Rod Stewart, Christina Aguilera, Fantasia, Aretha Franklin, Whitney Houston, Jennifer Hudson, Annie Lennox, Leona Lewis, Barry Manilow, Sarah McLachlan, Ruben Studdard, Carrie Underwood and Luther Vandross. Between 2012 and 2014, Seviour was Head Of Marketing at Epic Records, where he worked closely with Reid to relaunch the label. At Epic, he worked on campaigns for the likes of Michael Jackson, Sara Bareilles, Avril Lavigne, Fiona Apple, Jennifer Lopez, Paloma Faith, The Fray, The Script and Meghan Trainor. Seviour will join an Apple Music team which includes two former Universal/Interscope high-fliers – Jimmy Iovine and his A&R protege, Larry Jackson. Meanwhile, Apple also recently hired the MD of Universal Music UK’s Commercial Division, Brian Rose – as Spotify nabbed Republic/Island’s Top 40 radio chief, Rob Harvey. 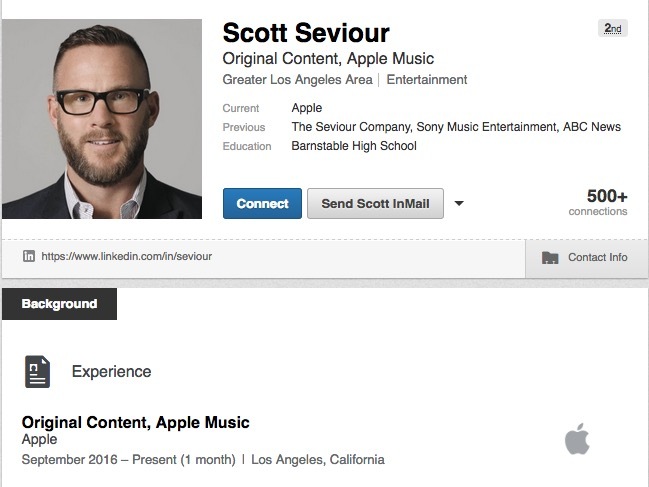 According to Seviour’s LinkedIn, he started a job working on ‘Original Content’ at Apple earlier this month. The inference: Apple is keen to use music biz expertise to help create fresh artist content on its service. That will probably sit better as a strategy in major label circles than the idea of Apple merely buying windowed exclusives – something effectively outlawed by Lucian Grainge at Universal Music Group last month. However, the industry reception to Apple’s ‘original content’ probably all depends how close it is to the kind of copyrighted material labels have built their businesses on.